Peter Blake and Julian Neski, architects, 1962. Photo: Courtesy Julian Preisler. 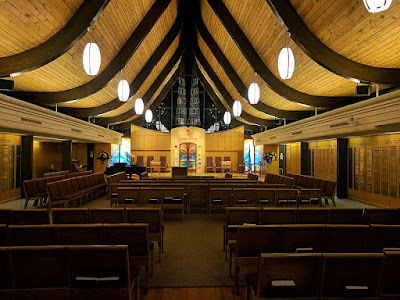 While I was preparing a recent paper on the popularity of the tent motif in mid-century modern synagogue architecture, I learned that Temple Emanu-El, a well-known example of the form in Livingston, New Jersey, recently closed its doors for Jewish worship and was sold to a church. 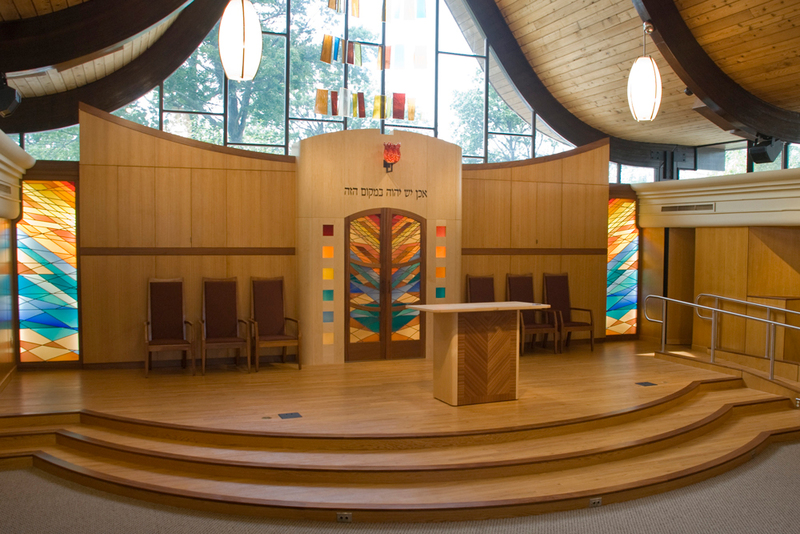 As with the recent closure of Temple Emanu-El in East Meadow, New York, this is another sign of generational shift in Jewish demographics and religious affiliation, as well as in architectural style and popular taste. Both synagogues were featured in the influential exhibition and catalogue Contemporary American Synagogue Architecture held at the Jewish Museum in New York in 1963 and curated by the then (largely unknown) Richard Meier. Temple Emanuel in Livingston has a distinctive bifurcated roof of thin gently bent and upward sweeping wooden sheets that gently meet across a line of open light at the apex. Light comes in from above, at the "crease" of the tent, and also pours in from front and back gables of clear glass. 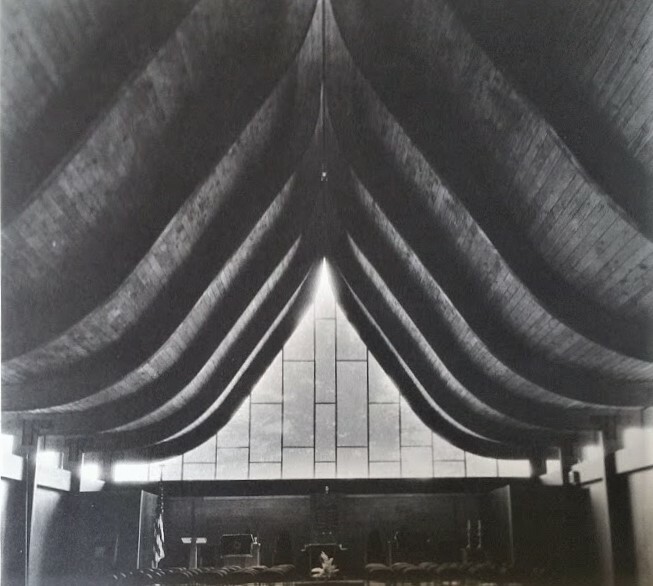 Several synagogues included in the 1963 exhibit expressed tent-like elements in their roof designs, or recalled in their support structure the modular framework of the Mishkhan, as described in Exodus. 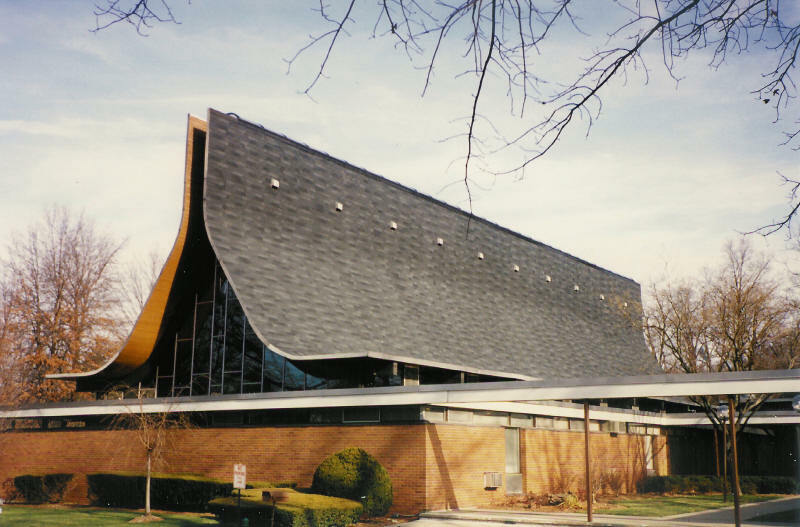 Since the 1950s, references to more canopies of all sorts become increasingly common in synagogue architecture. In the face of the destruction of European communities and synagogues in the Holocaust, architects sought designs reflective of the Jewish exodus, exile and diaspora (dispersion), and which gave physical form to the now obvious transient nature of Jewish settlement and security – even in the seemingly safe sanctuary of the United States. The synagogue-tent connection was reinvented, or at least revived architecturally, as Jews searched for an alternative to seemingly failed Classical and Medieval historicist and assimilationist forms. After World War II, increasingly the tent form replaced the dome as the most popular expressive synagogue roof element. Blown and formed concrete, formed-plywood and other laminates, and even plastic, allowed architects Percival Goodman, Frank Lloyd Wright, Lew Davis and Sam Brody, Minoru Yamasaki, Peter Blake and Julius Noski, Sydney Eisenshtat, Kivett and Myers, William Bernoudy, and others, to experiment with the tent for new expressive forms. Many of these work survive - but more and more are being significantly altered, or destroyed outright. The building is also important as the work of two notable modern architects. Blake and Neski worked together to design many elegant modern houses that had light footprints on the landscape. Born into a Jewish family in Berlin in 1920 as Peter Jost Blach, Mr. Blake was sent by his parents to school in England after the Nazis came to power. He attended schools in London until World War II and then moved to the United States, where he enrolled in the architecture school at the University of Pennsylvania and worked briefly for the architect Louis Kahn. He became a citizen in 1944 and changed his name to Blake. By then he had struck up an acquaintance with a wide and often rambunctious circle of artists, architects and writers, from Pollock to Charles Eames. 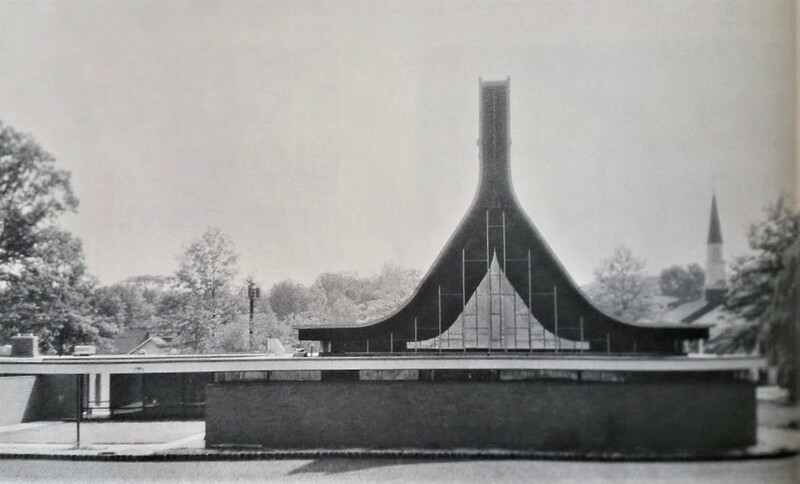 In 1948, he was named curator of architecture and design at the Museum of Modern Art, where he remained for two years, writing a monograph on the architect Marcel Breuer. Books exploring the legacy of Frank Lloyd Wright, Le Corbusier, Mies van der Rohe and Philip Johnson followed.From 1965 to 1972, he was the editor in chief of Architectural Forum (now defunct), which attracted a wide following with its articles on the home-building industry as well as architectural currents. Mr. Blake then founded his own magazine, Architecture Plus, where he worked until 1975. In the world of synagogue architecture, Blake is also widely known for co-editing the 1957 book An American Synagogue For Today And Tomorrow: A Guide Book To Synagogue Design And Construction published by the Union of American Hebrew congregations. 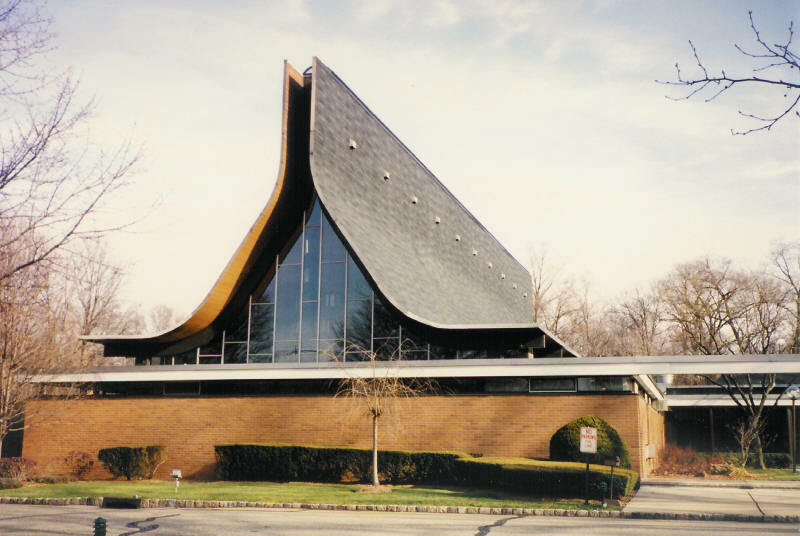 Temple Emanu-El of West Essex in Livingston, New Jersey, was founded in 1955. 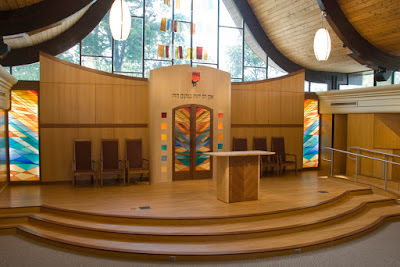 The congregation closed in 2018, and merged with Temple Sinai in Summit, NJ. The synagogue was sold and is now the Living Stone Christian Church. The former school buildings have become part of a Mandarin (Chinese) and Spanish language immersion center. The rise and fall of the congregation is indicative of general trends in many American suburban congregations founded in the post World War II period. Begun by 11 families seeking a Reform Jewish service in a growing suburb, by 1955 it had expanded to 56 families and by 1961 ground was broken for the new sanctuary. Th choice of Blake and Neski demonstrates the congregations tastes - and ambition. Tastes and needs change. There was a major expansion in 2004 prior to the congregation's 50th anniversary, including a new main entrance, office space, the library, and the Holocaust Remembrance Center, and Early Childhood Center. Livingston, New Jersey. Temple Emanu-El of West Essex. Peter Blake and Julian Neski, architects, after 2010 renovation by David and Michelle Plachte-Zuieback. Photo: Scott Brody. And then in 2010-11 the sanctuary was remodeled in accord with present-day tastes in comfort and decoration. David and Michelle Plachte-Zuieback, leading designers of contemporary synagogue stained glass, created stained glass a new this sanctuary installation for the Ark wall that consisted of a new maple and cherry wood Aron Ha-kodesh with stained glass doors as well as two stained glass artificially-lit sidelights. At some point is appears the congregation introduced flexible seating, and also strong horizontal interior cornices below the "tent" that changed the spatial dynamic. These changes were not, however, enough to sustain the congregation. In 2017 it was announced that the congregation would close and then sell its facility due to financial hardship. I can only speculate on the reasons for the hardship - but they are not difficult to surmise. Jewish populations are declining in post-war Northern suburban suburbs - due to the death or movement to the south and west by the founding generation, and a low Jewish birth rate and movement away from suburbs by younger generations (in sharp contrast to many urban Orthodox communities). This is combined overall with less synagogue affiliation - even among self-identifying Jews - and amidst competition (and duplication of resources) between surviving synagogues. Combined with this are the often ballooning costs of maintenance, and heat and cooling of mid-century buildings, where often the original material are reaching the end of their anticipated lifespans. There are changing congregational needs that are sometimes met with building new structures and changes in taste which are sometimes met with remodeling. But even these fixes are often not enough to sustain small congregations which - without financial angels or a large endowment - often exist year-to-year on the edge of a financial cliff, depending on ever-declining dues against ever-increasing costs. Frist building needs are neglected. Then staffs are cut. Then a congregation is forced to close. These forces have been recognized for at least twenty years, but we are still in the midst of a major synagogue shake-up which means fewer synagogues in the north, with new - but usually smaller - synagogue buildings erected in the south, southwest, and west. Modern-era synagogues in New York New Jersey and other states are at risk - and if we cannot save them, we must at least fully document them while they are in use. Next door to the Old Synagogue of Plzen (about which I wrote the other day), on the ruins of another synagogue building, is a modest Holocaust memorial; the collaborative work of a local teacher, students, Jewish community members and Holocaust survivors. The monument was inaugurated in 2002 on the 60th anniversary of the deportation of Plzen's (Pilsen) Jewish community to Terezin. The memorial and is materially simple but conceptually rich. It draws on some of the oldest and best traditions of Jewish commemorative practice including the piling of stones, the naming of names, and the respectful treatment of the ruins of holy sites, including synagogues. Perhaps equally important is that this was a collaborative effort, locally conceived, that grew from a teacher’s vision and student engagement. While publicly inaugurated and created with modest but essential city support, the memorial is a very private place. One needs to find it. The progression leads from Stephen’s Square (today’s Smetana Park), from the portal of the Jewish Community building, through the vaulted passageway into the courtyard, and then around the substantial Old Synagogue. The monument's solitude is a virtue for contemplation, but removes it from the broader public view afforded the traditional "monuments to great men" adorning Smetana Park, such as that to Josef Frantisek Smetana (Tomáš Seidan, sculptor, 1874), the Czech poet, philosopher, physicist, and Roman Catholic priest after whom this section of the park is named. Plzen, Czech Republic. Facade of Jewish Community building at 80/5 Stephen’s Square (today’s Smetana Park). Photo: Samuel D. Gruber 2018. Plzen, Czech Republic. Entryway to courtyard of Jewish Community complex at 80/5 Stephen’s Square (today’s Smetana Park). One can just see the flank of the Old Synagogue through the door. Photo: Samuel D. Gruber 2018. The memorial exists within the ruined walls of the so-called Auxiliary Synagogue, also known as the Old Jewish School that was built in 1875 next to the Old Synagogue. The two structures were joined by a stone staircase to the galleries. After the opening of the New (or Great) Synagogue in 1893, the Auxiliary Synagogue was used for storage and today only the outer walls survive to enclose the Holocaust Memorial. This was built as part of the project “Year 2002 — Year of Memories,” in which Plzen hosted various events to commemorate the Holocaust, and in particular the 60th anniversary of the deportation of the local Jewish community in January 1942 when Plzen’s 2,604 Jews were sent to Terezin, and then to concentration and death camps, including Auschwitz. Only 204 survived. 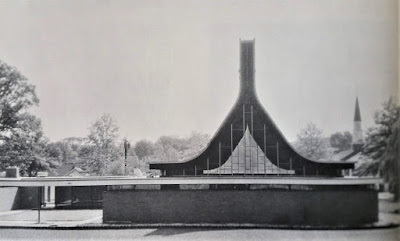 The idea for the memorial came from Radovan Kodera, a local conservationist and photographer who got the idea when photographing the massive New Synagogue which once seated up to 3,000 people. Plzen, CZ. New Synagogue, 1893. Empty seats. View from rear of women's gallery. Photo: Samuel D. Gruber 2018. Plzen, CZ. New Synagogue, 1893. Empty seats. Photo: Samuel D. Gruber 2018. “I was walking through the empty, decaying building and thought it would be interesting to place stones on the places where the people used to sit,” Kodera said. About two years ago [ca. 2000], he revived his idea and decided to use the ruins of the old Jewish school. Around the same time, Kodera came across a series of photographs of the Jewish transport. One of them showed a family with children, each with a number hanging from their necks. “Suddenly I wanted to know what happened to those people,” Kodera said. “I went to search the archives in Prague and found them by the numbers” around their necks. The Rosenbaum family, for example, was transported from Terezin to Sobibor in eastern Poland, where the entire family died. “It had a very strong impact on me and I thought that it could have the same effect even on other people,” explained Kodera, who is not Jewish. “For most people it is just about statistics, but if they know a name and write it down themselves, they might develop a personal relationship with the victim. Even relatives of victims who were not from Pilsen asked if they could inscribe their family members’ names on the stones. That explains why there are 200 more stones in the Old Jewish School than the number of Jews who died in the Pilsen transport. Local grammar school students [who are now adults], who participated in Kodera’s project from the very beginning, now know detailed information about the fates of the Jewish victims. “I wanted students to take part in it, to be involved,” Kodera said, stressing how important it is for young people to be interested in history. The students picked up and washed the pebbles and experimented with different types of paint that would be weather resistant. They also gave special Japanese-made marker pens to visitors who chose a stone and inscribed a name on it. Now, since the Old Synagogue has been restored and fitted with a permanent exhibit on Jewish Traditions and Customs as part of the EU-fund and Jewish community sponsored 10 Stars Revitalization of Jewish Monuments in the Czech Republic project, it is hoped and expected that more visitors will come to the memorial. I certainly hope so. Plzen is a beautiful town, mostly by-passed by foreign tourists to the Czech Republic who flood Prague every year. Plzen, Czech Republic. Sign announcing the Old Synagogue (and Holocaust Memorial) as partof the 10 Stars project. Photo: Samuel D. Gruber 2018. Remembering names - writing them and reciting them - is among the oldest form of perpetuating Jewish memory. We have genealogies in the Book of Genesis, martyrologies after medieval massacres in Worms and elsewhere, and Yahrzeit plaques in synagogues naming the dead and the dates on which they must be remembered. The earliest Holocaust memorials ranging from landsmanschaft plats in American Jewish cemeteries to the memorable and influential walls of names in the Pinkus Synagogue in Prague attempted to identify the victims and list their name so they would not be forgotten. 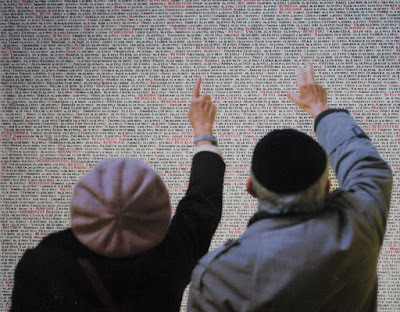 The culmination of this process - still ongoing - is the collection of all the names of the approximately 6 million victims of the Shoah by Yad Vashem into a single work - the multi-volume Book of Names, which now lists the names of over 4 million Jewish victims, where I recently found the list of all the Samuel (Shmuel) Grubers known to have perished in the Shoah. Prague, CZ. Pinkus Synagogue, Wall of Names memorial. Photo: Jewish Museum of Prague. Auschwitz I, Poland. Shoah Pavilion (Block 27), Book of Names. Photo: Samuel D. Gruber 2018. Plzen, Czech Republic. Holocaust Memorial (2002) inside walls of former Auxiliary Synagogue (1875). Photo: Samuel D. Gruber 2018. So too, piling stones is an ancient Jewish custom of memory. Jacob said "Collect some stones" (Genesis 31:46) and Laban said to seal a contract with Jacob, "Let this cairn be a witness" (Genesis 31:48. Today we brings stones to a grave as a mark of love, respect and veneration. We don't know the origin of this custom, and in the ancient past there was perhaps a more practical purpose, to better mark a place to warn of ritual impurity and/or to better to mark and protect the grave. As memorials to people, stones are seen to be strong and enduring. Some scholars have suggested that the process of putting stones on graves, however, is more a reaction to the Christian custom of placing flowers, and it is true that many European Jewish "traditions" are actually reactions to - often in a contrarian way - popular Christian practice. Whatever the source, creating memorials with the gathering of stones of different shapes and sizes has become a way to literally build Holocaust memorials. 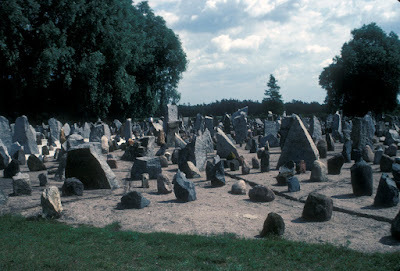 In a general way, this creates, or re-creates the community of memorial stones of a Jewish cemetery. Some memorials, such as at the killing site of Treblinka, recall cemeteries. 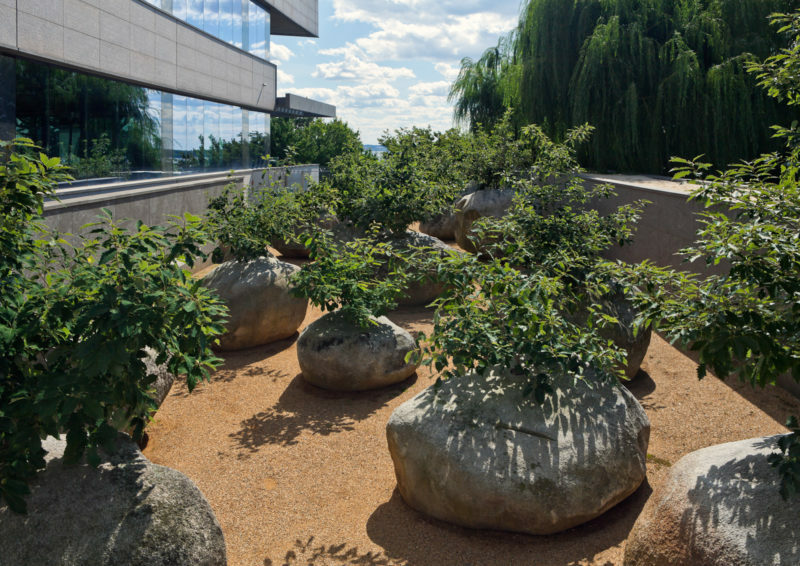 Other memorials with stones, often far from the places of horror, respond more to the tradition of cemeteries as gardens, such as the memorial garden designed by Andy Goldsworthy at the Museum of Jewish Heritage in New York. But in New York, the narrative is about commemoration but also renewal. In the stones are drilled holes, from which trees take life and grow. The variations of the "stone garden" are many, and I will discuss other versions in future posts. Treblinka, Poland. Memorial. Photo: Samuel D. Gruber 1992. New York, NY, USA. Museum of Jewish Heritage, Garden of Stones. Photo: David Paler/Museum of Jewish Heritage. The Plzen Memorial is a modest but very effective Holocaust Memorial. It was made with wide and sincere community input. Significantly it cost very little. Apparently the City of Plzen contributed $2,000 and this was enough. Even if more funds were used, the amount is tiny compared to the millions spent on so many less effective monuments! Go visit Plzen! Visit the Jewish sites. Of course the food and beer are good, too. Plzen, Czech Republic. Old Synagogue, 1857-59. Interior. View of women's galleries. Photo: Samuel Gruber 2018. Plzen, Czech Republic. Old Synagogue, 1857-59. Stairs to women's galleries. Photo: Samuel Gruber 2018. I have been traveling the past few weeks with Jewish-Heritage-Europe.eu editor Ruth Ellen Gruber to visit several dozen Jewish heritage sites in the Czech Republic and Poland. We've wrapped up our July "shul patrol." By my count I visited 30 synagogues (and a few dozen cemeteries, Jewish quarters or ghettos, and Holocaust-related sites and monuments). One of the big questions I was asking on this trip, which is of ever-increasing interest to my students, is "where were the women in synagogue practice and in the synagogue space?." This is a topic that is often addressed in a vague and general way, but only a few books and articles try to address women's experiences in synagogues at different times and places and these cite few real examples. Here's just one intriguing example from Plzen, from only the 2nd day of our trip. Plzen, Czech Republic. Old Synagogue, 1857-59. View to Ark with two levels of women's galleries. Photo: Samuel Gruber 2018. Plzen, Czech Republic. Old Synagogue, 1857-59. Women's gallery. Photo: Samuel Gruber 2018. Jews were expelled from Plzen in 1504 and only allowed to return in the 19th century. The Romanesque-style Old Synagogue was built in 1857-59 in the courtyard of 80/5 Stephen’s Square (today’s Smetana Park). Though impressive - it was not visible from the street. Architect M. Stelzer designed the substantial structure that was built by W. Wiesner. The rectangular building has a footprint of 20 x 14 m. and is 12 meters high. What is remarkable is the two-story wooden gallery for women. Already by mid-century the revived community had - or expected - a substantial number of women attending synagogue (on the Sabbath? only of holidays?). I know of only one other 2-level gallery in the present-day Czech Republic; the earlier 19th-century and now fully restored synagogue at Brandys nad Laben. There were, however, several near-contemporary examples in the Austro-Hungarian lands, notably the Tempelgasse Synagogue in Vienna (dedicated 1858) and the Dohany St. Synagogue in Budapest (1854-1857). Other slightly later examples are Timisoara, Romania, 1863-64 and Pecs, Hungary, 1868-69. All these synagogues, however, used iron supports, while the Plzen synagogue uses wood. Vienna, Austria. Tempelgasse Synagogue in 1904. The two winding stone staircases are entered through doors flanking the main entrance on the west facade. There is also an external staircase on the north side, apparently built for emergencies. I'm sorry for the elderly - the path up the winding stone stairs to the women's sections is narrow and treacherous. I hope they wore the right shoes! The galleries themselves had flat floors with no slope, and solid parapet walls shielded them form the main sanctuary space. Presumably the women sat on benches, and if these were set directly on the floor then only women at the parapet - who craned their necks or were standing - would get any view of the ceremony down below. The women were in the synagogue but not of the synagogue. From these galleries and many others it was almost impossible to see or hear anything of what went on below, and it can get very hot and stuffy the higher one goes. It is possible that women had their own prayer leaders, known as firzogerin, who led prayers for women in the weibershul (women's gallery) , This is known to be the case from other 19th-century synagogues, as is described by Pauline Wengeroff in her memoir. This is also the period when printed prayer books for women became increasingly accepted and popular. Fanny Neuda published her popular collection of prayers, Stunden der Andacht: Ein Gebet- und Erbauungsbuch für Israels Frauen und Jungfrauen zur öffentlichen und häuslichen Andacht (Hours of Devotion: Book of Prayer and Edification for Jewish Wives and Young Women) in 1855, just two years before the Plzen community began construction on the new synagogue. This was the first such book written by a women for women in German, not in Yiddish. The book was published in Vienna and went through many editions. First edition of Stunden der Andacht: Ein Gebet- und Erbauungsbuch für Israels Frauen und Jungfrauen zur öffentlichen und häuslichen Andacht by Fanny Neuda, published in 1855. This copy on view in the synagogue of Lostice, CZ, where her husband was rabbi. Photo: Samuel Gruber 2018. Plzen, Czech Republic. Old Synagogue, 1857-59. Entrance to women's galleries which flank main portal. Photo: Samuel Gruber 2018. Plzen, Czech Republic. Old Synagogue, 1857-59. Exterior steps to women's gallery. Photo: Samuel Gruber 2018. The former synagogue is now one of the Ten Stars Revitalization of Jewish Monuments in the Czech Republic project, and it has been beautifully restored and houses the exhibition "Jewish Customs and Traditions."